men and boys around the world are standing up to challenge the attitudes that lead to gender inequality. Why is gender equality a man's issue? Male-dominated power structures, socially and culturally entrenched male privilege, sexist attitudes towards women – there's a lot to overcome before gender equality can become a reality. 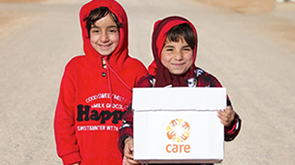 CARE believes that we cannot overcome poverty until all people have equal rights and opportunities. That's why CARE's work around the world seeks to address the structures and attitudes that perpetuate gender inequality. And our work shows that men are increasingly recognising the benefits of a fairer, more equal world. People of all genders want to live in a world of hope, tolerance and social justice. Women and girls are leading the way in standing up for their rights. But men and boys have a crucial part to play too.